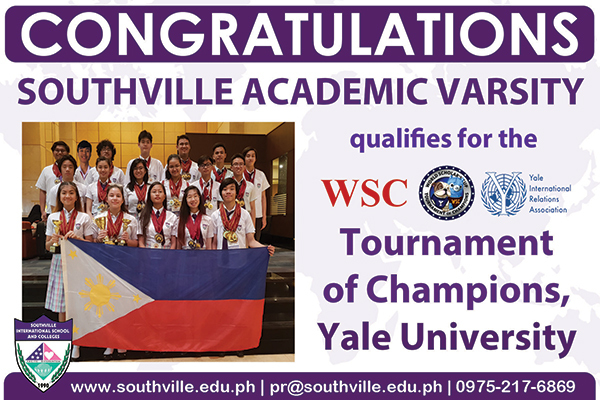 Competing against 4,000 plus students from 39 countries worldwide, the Southville Academic Varsity composed of Miguel Dominico Alzona, Mikhail Astin Alzona, Geoffrey Eliezer Borabien,Princess Aguilar, Akisha Julianne Cu, Robert Constantine Rivera, Paul Andrew Tatad, Hyuk Jin Park, Jasmine Reeves, Syna Vastardis, Cuitlauzina Brianna Cerbito, David Jacob Ramos, Matthew Ezekiel Sybingco, Rance Gabriel Llovido, Gabrielle Anindito, Io Carpiso, Nicholas James Gonzales, and Renz Leobert Del Rosario arrived victorious as they brought home more than 90 gold and silver medals and trophies from the World Scholar’s Cup Global Rounds held last June 18-23, 2018 in Kuala Lumpur, Malaysia. The event which is a popular academic competition amongst international school students in the world is an international competition which requires participants to compete in four challenging events: Team Debate, Collaborative and Individual Writing, Scholar’s Challenge and Quiz Bowl. They also need to fully master the lessons in six different areas such as Science, Literature, Arts and Music, History, Human Relationships, and Social Studies which are based on this year’s theme “An Entangled World.” Participants aim to compete for both individual and team awards, as well as to meet the qualifying team threshold mark for the forthcoming Tournament of Champions to be held at Yale University. “I am inspired by our students growth and grit mindset during their preparation for the contest. The commitment of our teachers who served as their coaches is also commendable as well as the support of our parents. This is a great way to end the school’s summer break-winning in an international competition,” shares Ms. Avic Suarez, Southville Principal. All the six teams qualified for the Tournament of Champions to be held at Yale University in November.